Also participating in the conference were FAIMER President and CEO John Norcini; FAIMER faculty members Wagdy Talaat (PHIL 2007), Huseyin Cahit Taskiran (PHIL 2003), and Ara Tekian; and FAIMER Fellow Ayhan Caliskan (PHIL 2008). Dr. Norcini served as a member of the SIMEC 2012 Advisory Committee, conducted a pre-conference workshop on “Assessment in the Workplace,” and delivered a plenary address titled “Medical Education as a Vehicle for Improving Healthcare.” Dr. Talaat co-conducted a pre-conference workshop on “Accreditation in the Eastern Mediterranean Region, Revisiting the Practice and Basic Concepts” and served as a panel discussant in a symposium on “Accreditation and International Dimensions of Medical Education.” Dr. Tekian organized a workshop on “How to Integrate and Measure the ACGME Core Competencies at the Undergraduate Medical Education Level” and gave a presentation titled “Does Faculty Development Develop Faculty” as part of a symposium on “Innovations in Medical Education.” Drs. Norcini, Talaat, and Tekian each received an award for their invaluable contributions as honored international guest speakers at the conference. In May, the National Authority for Quality Assurance and Accreditation of Education (NAQAAE) in Egypt granted its first institutional accreditation to The Faculty of Medicine, Suez Canal University. FAIMER Fellow Wagdy Talaat (PHIL 2007) is a faculty member and heads the Medical Education Department at Suez Canal University. Egypt’s national accreditation process focuses on two main principles: mission-based assessment (institutional capacity), and outcome-based assessment (educational effectiveness). NAQAAE performs multiple pre-accreditation and accreditation site visits to the institution throughout the process. NAQAAE was established by law in 2006 and by presidential decree in 2007. Over the past two years, it has developed national standards for every discipline in higher education, working through government-funded accreditation projects and in collaboration with The World Bank. NAQAAE’s predecessor, the National Quality Assurance and Accreditation Committee (NQAAC), worked for five years to spread quality assurance plans among higher education institutions, prepared the national law for accreditation and sought its endorsement by Egyptian parliament, and laid the groundwork for the independent body that became NAQAAE. Dr. Talaat served as a member of NQAAC. For more information on Egypt’s accreditation system and the National Authority for Quality Assurance and Accreditation of Education, visit http://en.naqaae.org.eg/. Management Sciences for Health (MSH), a nonprofit organization dedicated to improving the health of the world’s neediest countries by helping managers and leaders improve health services, announced in March the recipients of its annual Leadership and Management Awards for 2010. 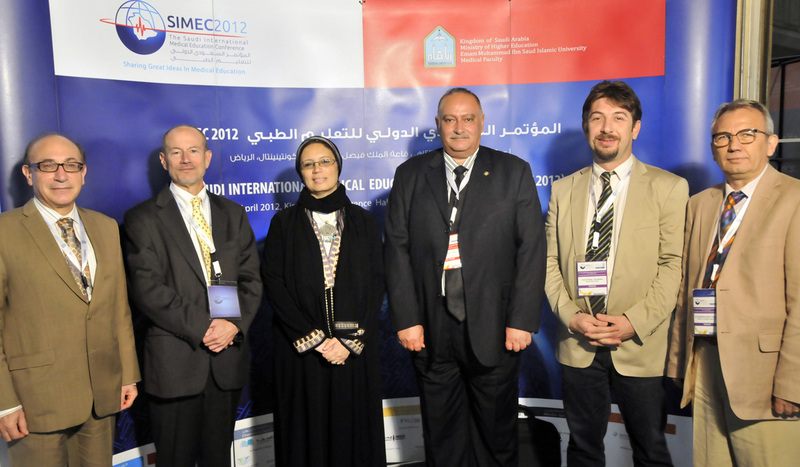 Receiving the third-place award was the Medical Education Department of the Faculty of Medicine, Suez Canal University in Ismailia, Egypt, under the directorship of 2007 FAIMER Institute Fellow Wagdy Talaat. The Leadership and Management Awards are given annually to managers and teams of organizations that work to improve the health of their communities, and who demonstrate measurable and compelling results in overcoming challenges related to organizational improvements and services. As Founding Chair of the Medical Education Department, Dr. Talaat helped to establish the department’s two distance-learning programs: the Diploma of Health Professions Education (DHPE), which was planned by Dr. Talaat during his FAIMER fellowship, and the Joint Master of Health Professions Education (JMHPE), which is administered in collaboration with Maastricht University in the Netherlands. The DHPE began in 2008 and is a national program open to health professionals in Egypt; the JMHPE began in 2005 and is an international program open to health professionals throughout the Eastern Mediterranean region. Alumni of both programs include presidents of universities, deans and vice deans of medical, dental, pharmaceutical, and nursing schools, as well as department chairs, and other educators. Dr. Talaat says that he is proud of the international recognition that the Medical Education Department has received but knows that there is still much work to be done. He and his team envision qualifying 5% of all health professions educators in Egypt through the DHPE within the first five years of the program. The JMHPE is one of the largest programs of its kind in the world, but there are countries in the region that need additional help. To encourage participation from faculty in under-resourced countries, such as Yemen, Jordan, Syria, Lebanon, and Morocco, funding is provided by both Suez Canal University and the World Health Organization (WHO) Eastern Mediterranean Regional Office (EMRO). For more information on the 2010 Leadership and Management Awards and awardees, log into the MSH website and visit the Leadership and Management Awards page (http://leadernet.msh.org/page.cfm?c1=534&nav=410). On November 1, 2009, the Faculty of Medicine at Suez Canal University in Egypt celebrated the graduation of 34 health professionals as the first class in its Diploma of Health Professions Education (DHPE) distance learning program. The graduates are mid- to senior-level faculty from 11 different health professions education institutions in Egypt, and senior trainers from Egyptian Ministry of Health training centers. News of the graduation was broadcast on Egyptian national television, satellite channels, talk shows, and the popular show Good Morning Egypt. Higher education officials in Egypt consider the DHPE program to be a key component in a new era of health professions education reform in the country, and recognize that faculty is the cornerstone of such change. Thirty-two new fellows have registered so far for the program’s second class. Dr. Wagdy Talaat (PHIL 2007), Director of the DHPE program and Founding Chair of the Medical Education Department at Suez Canal University, planned the Diploma during his FAIMER fellowship in 2007 and launched the program, exclusively for Egyptians, in October 2008. He and his colleagues envision training five percent of all health professions educators in Egypt in five years through this national program. For more information on the Suez Canal University DHPE program, please visit http://www.dhpescu.org. The Medical Education Department (MED) of Suez Canal University (SCU) in Ismailia, Egypt, has recently forged relationships with two other universities that will advance health professions education in the Middle East and Northern Africa. Under the leadership of 2007 FAIMER Institute Fellow Wagdy Talaat, M.D., Ph.D., Professor and Head of SCU-MED, agreements were signed with the Iraq branch of Lahaye International University, the Netherlands, and with Libyan International Medical University (LIMU), Benghazi, Libya, to expand those institutions’ medical education offerings. The Tikrit, Iraq, branch of Lahaye International University, College of Applied Medical Sciences, has agreed to offer a Joint Diploma in Health Professions Education through Distance Learning with the SCU Faculty of Medicine. The diploma is an extension of SCU’s Diploma in Health Professions Education with the important condition that it be offered exclusively to Iraqi health professionals at the Iraq national level. The diploma is the third health professions education degree offered by SCU. The program is expected to launch in October 2009. SCU has also agreed to collaborate with Libyan International Medical University (LIMU) in Benghazi, Libya, to train faculty in innovative health professions education methods and to develop a problem-based learning (PBL) curriculum. The program will be offered to LIMU’s faculties of Medicine, Dentistry, Pharmacy, Nursing, and Basic Sciences. The PBL curriculum has been outlined and the initial faculty training session was conducted during the first two weeks of July 2009. LIMU is expected to launch the first PBL module in October 2009.